﻿ How tall is that tree? How can you determine the approximate height of a tree without felling it? There’s no single answer to this. There are lots of creative ways. If it’s a sunny day, and the terrain around the tree is relatively flat (and open), you can compare shadows.  If you know your own height, and have a tape measure, you can measure the length of your own shadow and then measure the length of the shadow cast by the tree. The ratio of your height to your shadow is the same as the ratio of the height of the tree to its shadow. It's a simple calculation. What else can you do? Well, again, if the terrain around the tree is flat you can pace out from the tree a known distance and measure the angle to the top of the tree.  Then, using a little trigonometry, you can estimate height (the tangent of the angle is height of the tree divided by the distance from the tree). (and/or if the base of the tree is higher/lower than the observer). 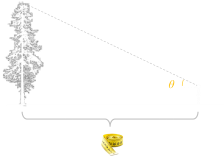 The technique requires both a tape measure and inclinometer (a tool for measuring the angle). Is there a technique we can use that removes these limitations? If we can assume you know your height then, yes, there is. There is a way to calculate the height of a tree without requiring a tape measure (using just angles), and this methond does not have the restriction that the base of the tree is at the same elevation as the observer. The first thing you need to do is stand in front of the tree and mark your height on the trunk. You can do this with a piece of string, chalk, or even a yellow ribbon. Then walk away from the tree to a location where you can see the top of the tree, the bottom, and ribbon. We don’t need to know the distance. Finally, we need to measure the angle to each of these points from the horizontal (or the vertical if you prefer, noting there is a 90° difference). Care needs to be taken about the sign of the angles. Any of them can be above, or below, the horizon level. The beauty of mathematics, however, is that, if we are consistent with our signs, this does not matter. We can see that (if we assume the tree is reasonably vertical), the angles form a collection of right angle triangles with the opposite edges forming parts of the spine of the tree. All we need to do now is create some simultaneous equations so that we can eliminate the perpendicular distance d we are standing away from the tree. The key to doing this is that we marked our height on the tree and, therefore, we know the value of hc. This would give an approximate height of the tree of 9.7m (31'10"), and you'd be observing the tree from the horizontal distance away of approx 15.2m (49'10"). All these things to one side, it's certainly a better way of doing it than chopping the tree down!